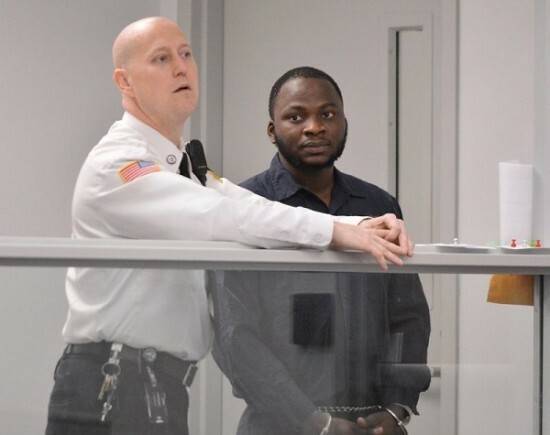 A Ghanaian who was arrested in April after telling his date that he was a terrorist and would blow up her University of Massachusetts dormitory pleaded guilty on Monday to a single charge of threatening to commit a crime. Abdul F. Ismail entered the plea in Eastern Hampshire Court, admitting to his role in the April 11 incident. He avoided any jail time as Judge Thomas Estes placed his conviction “on file” for the next 12 months, meaning no sentence will be imposed if he stays out of trouble over that time. However, Ismail was taken into custody by United State Immigration and Customs Enforcement shortly after the end of the court proceedings, according to Mary Carey, communications director for Northwestern District Attorney David Sullivan. Ismail, 27, has been in the United States since 2013. He came here from Ghana to seek asylum. His lawyer told the court that prior to his arrest, Ismail was due to have an immigration hearing about being granted permanent resident status next March. He was arrested after a woman that he had been briefly been dating reported him to police after their second date. The two had met through the online dating application Tender. The woman, a UMass student, told police that he came to her dorm room in Butterfield Hall, and asked her to print out a document on the recent bombings in Syria. When the woman said she was uncomfortable doing so, he reportedly said “I’m a terrorist” and that he planned to blow up the dorm. His lawyer, Alan Rubin, told the court that Ismail was only joking and that there was no evidence that he intended to carry out the crime. UMass police testified that the comment troubled the woman enough to where she ended their date, escorted him from the building, and then called the police. She was also so shaken the university had to find new accommodations for her because she refused to stay in her dorm room.